COE President, Keith Horton, kicks off the COE 2013 Annual PLM Conference & TechniFair by introducing the conference highlights and discussing COE's strategic direction. In this session Mr. Latchague will present a short review of the business highlights of 2012. The main focus of his presentation will be Dassault Systèmes’ business strategy for 2013 and beyond. The strategy is built on Dassault Systèmes’ 3DEXPERIENCE Platform which powers the Brand Applications to deliver full capabilities of 3D Modeling, Content & Simulation, Social & Collaborative innovation and Information Intelligence to build the right business value for the ultimate consumers. Bruno Latchague is a contributor over the past thirty years to the advancement of business automation solutions primarily in the manufacturing sector. Notable contributions include growing the leading PLM company in the world from a start-up to world leader. Including leading R&D through the creation of CATIA V5, the standard design language for automotive and aerospace, creating a 1000 person direct sales force. Currently Executive VP, Global Sales & Operations for Dassault Systèmes. Our customers are looking to design the safest, greenest and smartest products, but also how to create the desired, valuable customer experience suiting each market need. These compelling necessities are driving an increasing demand on engineers, designers, systems architects and collective groups inside and outside the company, in a world where products now combine hardware, software and electronics. Discover why and how providing a “common development experience” to you and your company, CATIA on DS 3DEXPERIENCE platform is setting new level of performance to enable the design and engineering of products and systems in digitally accurate 3D world, and ultimately, move from Product attributes to Product experience. Philippe Laufer was appointed CEO CATIA in July 2012. He has been THE Man behind CATIA for 27 years, namely as VP R&D since 2006. His contribution has been crucial to CATIA’s present leadership and he is unanimously recognized by our partners and customers as the worldwide CATIA expert. His deep knowledge of the industry as well as the 3DS 3DEXPERIENCE platform and V6 applications has already driven major successes deployments. Philippe continues to direct and oversee ALL CAD related apps for the group when it comes to R&D, technologies and components re-use. Ford’s Digital Integration and Automation leverages unique methodologies, integrating CAD and CAE tools and processes into a comprehensive platform with a common interface, creating a solution where the sum of the parts is greater than the individual. CAD and CAE resources are often limited or inconsistent during early concept phases of vehicle programs. Consequently traditional FE analyses are often carried out later than desired or with very limited scope/iterations to optimize design, leading to more design churn downstream and/or costly late changes. For certain class of analyses CAD/CAE integration templates can effectively address this problem by enabling design evaluation and optimization to be carried out with far less time and resources. The presentation will review some of the efforts at Ford Motor Company to develop and deploy CAD/CAE integration templates by leveraging integration in CATIA between CAD, CAE Modeling, and CAE Analysis. KyuYeon Sohn has had various roles in CAE, KBE, CAD, CAD integration and related applications for methods and tools development and vehicle program support for over 23 years at Ford Motor Company. Prior to Ford, KyuYeon worked at General Dynamics on structural analysis including damageability prediction of composite materials. Currently, he is the Supervisor of Concept CAE & System Engineering Section / Digital Innovation at FORD. His current focus includes CAD, CAD integration (Catia and I-DEAS integration with Teamcenter), CAE data management, occupant/vehicle and chassis/mechanical packaging engineering templates and tools, concept CAE, CAD/CAE integration templates, and system engineering. COE is very excited to announce the creation of a new member benefit! We conducted qualitative research on member and non-member needs during Feb – April 2012. We spoke with End Users, IT specialists/integrators and Managers; that expressed a strong interest in gaining information on user experiences with new DS product releases. 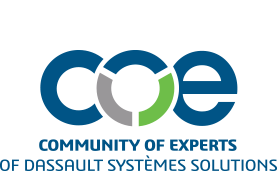 COE is partnering with Dassault Systèmes to enable members companies to gain invaluable hands on experience with V6. This project will provide member companies with and without a firm V6 migration plan, to experience this new platform first hand and provide DS with valuable product feedback. The panel of 25-30 COE members is currently in the concept phase, with design, and manufacturing phases to follow. The panel will provide attendees at the COE 2013 Annual PLM Conference April 21-24 with a report of their current state, as well as regular reports throughout the year. The expectation is that we will learn about CAD and PLM issues, infrastructure requirements and process concepts that can be passed along in the spirit of COE’s mission; to drive innovation and productivity using the DS suite of PLM products. Participants in the panel will be working on a pilot project for a windmill to cover as many disciplines as possible. The panel will consist of Design Engineers (10), IT Administrators (2), Manufacturing Engineers (3), Tooling Engineers (2), Stress Engineers (2), NC Programmer (2), Training Coordinator, Design Lead, and a Project Manager. All information will be non-proprietary; all experiences, forum threads and data generated by the panel to be initially housed in a private area of the COE web site. All documentation to be available to COE members once this program has completed. Like many manufacturing centric industries, companies in the aerospace and defense industry are being forced to adopt new strategies related to people, process and tools that result in increased efficiency without negatively impacting quality in order to compete successfully in today’s market. Government budgets to fund new programs in the A&D market space are shrinking due to funding cuts and project overruns across the industry. This trend is causing NASA centers to perform more work in-house to sustain their workforce vs. subcontracting to companies like Ball. Prime contractors are pursuing smaller contracts in an effort to improve sales resulting in increased competition in the market space Ball traditionally targets. Customers are striving to find suppliers that can provide the best functionality at the lowest price point with the lowest risk. Past performance on previous contracts is having a heavier weighting in the contract award decision. Ball is also experiencing an increase in the number of fixed priced government and commercial contracts being awarded for large development programs vs. traditional cost plus. A&D companies must execute effectively within each of these elements to survive. Customer perceptions and expectations must be monitored, managed and met to win new business. To meet these challenges, Ball management initiated several strategic enterprise process improvement projects starting in 2005 that have significantly improved our data automation and integration between systems, eliminated waste and improved visibility. These investments have made a positive impact on program execution performance on existing programs and increased our customer’s confidence regarding new business opportunities. Ball has experienced a steady increase in contract bookings since 2010 and celebrated a significant milestone in January of 2011 when our contracted backlog hit $1 Billion (22% increase from 2010). Ball Aerospace finished 2012 strong as well reporting record sales and profit to our shareholders. This session will present a brief overview of the process improvement strategies implemented at Ball while focusing primarily on the positive impact the implementation of the Dassault Systèmes Manufacturing Execution System (MES) has made on programs. Brian Bate has worked for Ball Aerospace for 28 years in various capacities including Manufacturing Engineering, Systems Engineering, Manager of Manufacturing, Program Manager, and Functional Manager on over 40 programs including instruments for the Hubble Space Telescope, commercial remote sensing and classified programs. He defined the manufacturing business processes for a new Commercial Space Operations division at Ball which has been very successful winning/executing contracts with commercial terms and conditions for over 15 years. Bate has led many teams over the years serving all aspects of the business including the selection and implementation of several enterprise software systems which include Product Lifecycle Management (PLM), Enterprise Resource Planning (ERP) and a Manufacturing Execution System (MES). He is currently leading an initiative to configure these same applications to support program execution activities inside classified programs. Bate received a bachelor’s degree in manufacturing engineering from Colorado State University. Join the COE Board of Directors as we recognize the COE award winners of the past year. Join COE to close out the conference together! The Top Gun and Poster Session winners will be announced at this time.